If I could choose to be any part of the hot dog, I would probably choose to be the charred marks from the grill or the watery part of the mustard. Really anything except for the chunky chunky relish. If the חניכים had to be any part of the hot dog, I do not doubt at all that they would choose the sausage-like structure that usually sits in the middle of the bun. 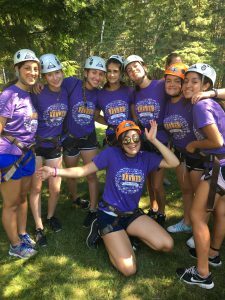 This would make the the bun the loving feeling and emotion of camp, and the toppin gs would be all of our exciting activities that give Yavneh summers their lemon zest! In this metaphor the צוות (staff) still get to be the charred part of the dog, warming it and leaving a lasting impression on it. That part is also objectively the best part of the dog. Upon waking after our amazing Acadia trip,, the חניכים (campers) were feeling majestic, empowered and strong, like an elephant with some kind leadership development training. And just like an elephant, the חניכים fell asleep deeply and restfully. Unlike an elephant, none of them are grey. Friday brought its usual schedule: ניקיון (cleaning), כיתה (class), מעלות פעולה (Ma’alot activity for growth and for laughs), and חוג (elective)! Supplemented by a lunch of fish sticks, the חניכים were ready as ever to have a ball on שבת (the Jewish Sabbath) that evening. Would you be surprised if I mentioned to you that that’s exactly what happened? That they did have that ball on שבת? How would you react to know that they were full of grace and contentment (unlike an elephant balancing on a ball)? Would it shock you to know that Brandeis professor Joseph Reimer’s (a past leader of מעלות’s שיחה (Shabbat afternoon כיתה) research into Jewish summer camps that states that relaxed behavior, closer emotional space and intensity are heightened on Shabbat was confirmed? I wouldn’t be shocked. And I wasn’t. As per the usual מוצאי שבת (Saturday night, literally “after Shabbat is out”) ritual, the כרם (CITs and oldest חניכים in camp) stayed in the צריף during the פגישת צוות (staff meeting), so they could grow closer to them and so we could have our meeting. Sunday, was a day. Not just any day, though. In the morning, the חניכים had their normal schedules (see above). For lunch, we were all excited to be eating borekas and split pea soup for lunch! Sunday afternoon we already began practicing for this writer’s favorite day of the summer: ריקודיה (the dancing performance second month where every עדה performs. It will be live streamed!!!!!!). Monday morning was normal, and this צהריים (afternoon) brings exciting sports and fun, and this ערב will be even greater… tune in soon to hear more!